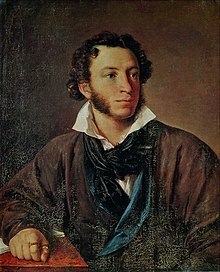 Alexander Sergeyevich Pushkin em i bin bon long 26 Mei 1799 (6 Jun New Style) 1799, long Moskow, mo bin ded long 29 Janewari 1837 (10 Febuwari, New Style), San-Peterburg. Em i bin wan man blong litorasa blong Rusia. This page was last edited on 20 Oktoba 2017, at 11:42.